On the second day in Taiwan, we depart from Da Keng Leisure farm to our next lunch destination! Fruits Family(果农之家) is the place where we are going to take our lunch at. If the fruits are ripe on the trees, visitors can also pick from the trees and eat as much as they can for a small fee. 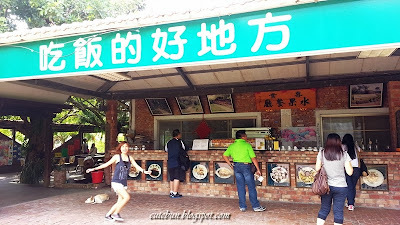 This restaurant is also part of Tian Mama where they cook healthy and fresh food right from their farm. The specialty is all of the dishes are paired with fruits since fruits are good for health. All the fruits are organic. After a photo taking session on the farm, we proceed in the restaurant to eat!!! Pickled green papaya was shredded, the taste is spicy, sour and sweet. I'm amazed to see how many types of fruits to be paired together to make unique dishes. If you are a vegan, they can also cook and use vegetarian materials only. Next we have fish! Passion fruit sweet and sour fish. I love the texture of the fish and the sauce is really tasty! Colourful fruits with fish is really good for skin. We also have mum's home cooked soup. The soup is really delicious full of flavours. I love pineapples and when paired with 3 layer pork then it's awesome! Sour and sweet, Chewy meat yet not greasy is the taste. This type of bean sprout is so cute and tiny and even the person that hated Malaysia bean sprout cannot resist this! The mango is so fresh and the hint of sourness with the juicy meat just made me salivate now. This is so cute!!! The salad is so addictive I ate 3!Fresh fruit combo with fresh prawns. So crispy and the durian is fresh too! The combination of thick durian and crispy outside yet juicy prawn is just perfect. Next we go to Tainan Duck Farm. This is a sightseeing farm and good learning experience for school children mostly and adults can learn something too. They started the farm mainly for duck eggs but over the years they decide to turn it into a learning experience farm to let children experience life at farms. The owner reciting the poem in hokkien or min nan yu. Guided tours are available at this farm. Entrance fee is NT100 per person. Cute ducklings doll for sale! That time the huge Duck was floating at Kaohsiung jetty but we are not going that direction so seeing cute duck dolls are cool too. There's a lot to do on this farm from camping to DIY own eggs, duck race, picking tomatoes, water activities like kayak and also smoked chicken/duck meat on the earth. The owner take us on a tour experiencing Tainan Duck farm. A lot of plants and trees here too. I'm a victim of a few mosquitos bites there so use that mosquitos repellent. I also get to launch this water pressure rocket with the rocket made of recycled soda bottle! Pretty fun to play with and a little wet too! There's also launch rocket competition to see who can launch their rocket furthest. The only catch is you have to run to the landing area to pick it back up before next launch. Next I did DIY salted egg and century egg at the farm. We also learn what are the ingredients needed to make them~ It was fun rolling the duck eggs in the earth, salt and also paddy rice skins. This DIY cost NT120 per person with 6 eggs. The whole tray full of eggs! This is where they cook/smoked under the earth for delicious duck/chicken meat. Visitors can also participate in roasting their own food under the earth that shape like a keyhole coupled with bricks. Visitors can also fish at the pond with a fee of NT100 whether with own fishing equipment or rented. Visitors can see a lot of animals in just one farm! All of the ducks lay eggs behind at the net. They collect the eggs only at certain hours to ensure the eggs are of good quality. We even feed the goats to get them to look at the camera. The pig is pretty cute with three colours on it. Naturally grown bamboos knit together making a calming arch. Visitors can also play with the rabbits in their petting area. That's all for now, hope to see you soon at Tainan, Taiwan. Tainan Duck farm also provides food for visitors for an affordable price. Airasia flies from Kota Kinabalu to Taipei daily on AK1518 and also from Taipei to KK on AK1519.